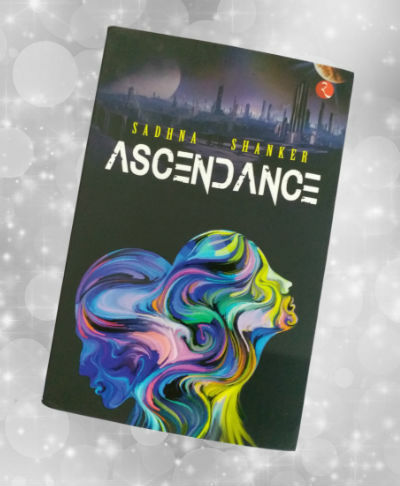 Recently we came across a book named Ascendance which is written by Sadhna Shanker. Sadhna Shankar work with Income Tax department at a remarkable position, but this is her first book. In this book she tried to explore a fictional world where everything is her creation. Being a person playing with the numbers and laws on daily bases writing a fantasy fiction which you can also call a science fiction is something you can do only if you love writing :). Though, the book is provided by the author herself, the views and reviews mentioned here are totally unbiased, as always. While a majority of people say that a book should not be judged by its cover, which is obviously right; it is also the truth that the cover page of a book makes a strong first impression about the same in a viewer’s mind. And, it is largely responsible for turning the user into a buyer (or a potential buyer at least). The material of the book cover page is quite smooth and of really good quality. In terms of its content, the black background having an illustration of two persons and showing a fictional locality in top-center, a little far behind, makes a good impression. The cover page could have been even better, but it creates a positive impression for sure. Let us have a bird’s eye view of the book plot. Far in some other galaxy, there is a planet which is similar to Earth in many aspects. It has its own sun (well, technically, Sun is a star and the planets revolves around the same, so we cannot use the phrase, but just for understanding purpose – as we can say our earth, our moon, our sun etc…) and 3 moons! The planetary movements are happening there with a different rate than the earth. So the measurement units (for time, distance) are obviously different. In future, due to ignorance and the habit of milking all the resources beyond a limit, the earth started experiencing the results. lethal winter and brutal summer are the only seasons on the earth those days. The intelligent people started thinking that the end of the planet is not too far. And, thus, they started looking for the alternatives. And, thus, this planet came to the radar of the researcher. And, when he is asked to give it a name. He thought Elone (short for “Earth Clone”) could be a proper word. Interestingly Elone now is divided into two parts. Two different species(!) live there. And they are separated by security fences (or barrier). They live so differently and cannot go beyond their part of the planet Elone, they started forgetting that the other part of Elone is there and the other species still live there. The things were working fine, till a tragic incident happened. In a part of Elone, a person was taken (taken is the word for death on Elone)! It was a rare incident. Since many years (again, the unit of measurement is not year) no one was taken. And incident it was the same day when a new creation (a birth) was happened! Everyone was worrying about this mishap – a person is taken! It is something significant that needs a thorough investigation. It could be a link of a chain of many unwanted things and probably needs to be worked on immediately. And, thus starts the journey to investigate the murder. And we are introduced to many characters, incidents, facts and much more. I will suggest you to explore it by reading the book :). The book is a complicated read on the first glance. When you start reading you are taken (not in the meaning of the word in Elone’s dictionary, of course 🙂 ) to a new world. I remembered watching Matrix movie and reading some segments of Harry Potter books while reading the first segment of the book. The character names, place names, terminology, everything is different, and it is a complex setup so you need time to settle down. But once you start reading the segment which explores the other part of Elone, and exploring the story of Maya, you will find it interesting and all the dots seems getting connected. This is the first book by Sadhna Shanker. She is a professional who probably got time to fulfil her passions now. And, it seems that the story was in her mind since years. The way she weaves a SciFi setup in the future, is something remarkable. She does a lot of research for the story and various parts of it, which is quite visible in the book. If the initial segment was written in simple words and made more interesting, the book can be a better reading experience. There is a glossary given at the end of the book. I will suggest you to read it first, so you can understand various alien terms. If footnotes are used in the book, the reader could find it very easy to link to those terms. We’d seen remarkable usage of footnotes in a book named The Infidel Next Door by author Rajat Mitra. The author doesn’t have any wrong idea about women empowerment. She understands the things very properly. She made the characters strong enough regardless of their gender. And, it works in favor of the book. Considering the complex nature of the book, the way she connects the dots is interesting. And yes, the book ends in a way that a possible sequel can also be there! It is not easy to create a new world and terminology. One require to imagine the things and then wave it with possibilities and probabilities. The author did it quite well. The book remains true to its genre. In order to avoid spoilers, I cannot tell much about specific incidents or characters (in fact, in the plot exploration also, I tried avoid all character names, apart from Maya), let me refer some of the pieces of writing from the book. Please read them with a consent that they may contain some of the spoilers 🙂 . Here is how in simple words, we can understand the humbleness and intelligence both, of a prime character. He is in conversation with Maya, about naming the planet. Maya, it will take a long time before we can figure out the technology that is needed for humans to travel such long distances and stay alive. People who actually live long enough to go there cane name it, whenever they reach. I am simply going to call it Earth’s clone, let us say, E-lone. Ideas are born from the union of reason, observation, imagination and quest. The basis of these ingredients may change, but since these concepts are never-ending, the ideas also remain. In the window, the first rays of sunlight made an appearance. Maya’s music continued to play as dawn broke in a world that did not recognize it, but was still enthralled by it. She understood the psyche, especially of those, who are engaged in a war like situation. And she represents it in simple yet effective manner. Does it matter whether we caused the nex or not? When you live on opposite sides of a fence, it doesn’t matter what is, but what one “thinks” it is. Their meeting was clearly over, but not this conversation. The author also know the effective ways to portray a character. He was as tall as Valhan and seemed to be overflowing from the chair. These quotes from the book should have already given you the idea of the quality of writing in the book. While it may look random, but the author has chosen the character names very wisely. I don’t think that naming a male character Ime and a female character Iwe is a random thing. Just look for the representation of “Men” and “Women” in those names! If you look at the names of two segments of Elone, you will find masculine and feminine difference there as well! So, it seems that, the author has put in genuine efforts from her side. A little complicated thriller which takes you to the fictional world. It reminds me of The Matrix film(s). Overall a joyous ride which you can take if you have a flair to pay attention while reading.